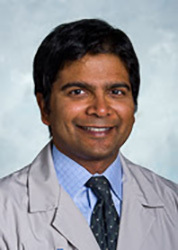 Dr. Sivaraja Kuppuswami is an emergency radiologist. He is specializes in providing optimal patient care in acute settings including in emergency departments, urgent care clinics and inpatient hospitals. Dr. Kuppuswami is committed to quality in radiologic interpretation in the timely care of patients. Dr. Kuppuswami earned his Bachelor’s degree in Electrical Engineering at the University of Illinois, Champaign-Urbana with Highest Honors. He received his medical degree at Stanford University. Dr. Kuppuswami completed his internship at Evanston Northwestern Healthcare in Evanston, IL and diagnostic radiology residency at Northwestern University in Chicago. He pursued fellowship training in musculoskeletal imaging at Evanston Northwestern Healthcare as well. Dr. Kuppuswami is Certified by the American Board of Radiology.